f.4 Hilly landscape with bullock-cart and palanquin in the foreground. 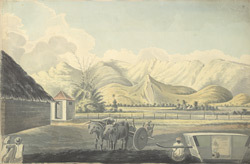 bl.uk > Online Gallery Home	> Online exhibitions	> Asia, Pacific and Africa Collections	> f.4 Hilly landscape with bullock-cart and palanquin in the foreground. Water-colour drawing by John Johnson of a hilly landscape with bullock-cart and palanquin in the foreground from A sketch-book of 36 drawings (36 folios) depicting scenes chiefly in W. India and Mysore. c.1795-1801. India has the largest number of cows and buffaloes in the world. Cows are regarded as sacred by the Hindus and are a symbol of motherhood and fertility. Bullocks in particular have an important economic value as they are widely used by farmers to plough the fields.